Every part of NVIDIA's business is growing at a breakneck pace, and growth opportunities abound. Shares of graphics chip company NVIDIA (NASDAQ:NVDA) rocketed 224% higher in 2016, according to data provided by S&P Global Market Intelligence. Impressive growth in all of its major businesses -- including gaming, data center, and automotive -- in addition to optimistic growth expectations led investors to pile into the stock throughout 2016. Shares of NVIDIA bottomed out in February, followed by a steady rise over the next eight months. NVIDIA handily beat revenue and earnings estimates when it reported earnings in February, May, and August, with its gaming business in particular proving resilient despite a weak PC market. The launch of NVIDIA's Pascal graphics cards, which currently includes the high-end GTX 1080 and GTX 1070, and the more mainstream GTX 1060, GTX 1050 Ti, and GTX 1050, was by all indications a major success. NVIDIA's third-quarter report in November was a blowout. The company beat analyst estimates for revenue by $310 million, growing sales by nearly 54% year over year. The gaming business accelerated, producing $1.244 billion of revenue, up from just $761 million during the prior-year period. Automotive sales came in at $127 million, up 60% year over year. The star of the show was the data center business. The data center segment generated $240 million of revenue, nearly tripling compared to the third quarter of the previous year. NVIDIA's focus on pushing its graphics cards for deep learning and artificial intelligence acceleration paid off in a big way, and the stock exploded higher as a result. With NVIDIA now trading around 9.4 times trailing-12-month sales and 47 times earnings, investors are betting that NVIDIA can keep up its rapid growth rate. The big opportunity for NVIDIA is artificial intelligence (AI), which will require processing power that NVIDIA's graphics cards are well suited to provide. An analyst estimated in November that AI represents a $15 billion opportunity for chip companies, noting that NVIDIA is in prime position to benefit. Whether NVIDIA can continue to grow so quickly, particularly its gaming business, which will face new competition from AMD's Vega graphics cards next year, is an open question. The growth opportunities in automotive and AI acceleration could be huge, but the stock may already be pricing them in. 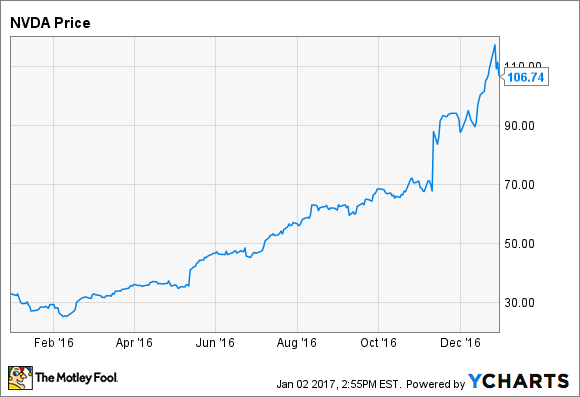 NVIDIA will need to deliver incredible growth in order to keep investors happy. Anything less could lead to a lackluster 2017 for the stock.